Interrupting 31 Days to Find Your Voice for a little soul revealing healing. Sometimes it’s the little revelations that hit you and you have to be brave and share. But now, it’s my insecurities who are dancing. Here I see just how very wide I am, how the rain has made my hair fuzzy, and the Indian in me casts my armpits gray no matter how clean shaven they are. My width is on full display here…there is no hiding the toil stress has take on my body. My glasses, the marker of how blind I really am. Four eyes has never really been deemed pretty. Pretty is perfect, right? At least that’s the slaughter we’ve been led to believe. If I share this people may assume the worst about me—and it may be true. They may rejoice in my faults and failings. They may laugh, adding fuel to the insecurities. If I am to be who I truly am. If I am to make art without mimicry, then this is me. To accept myself, to pursue true life even though my outward appearance may deny me acceptance, may invite ridicule. If I want to be free, I must let go of my insecurities, let loose others opinions. I must break the chains one twirl in the rain at a time. Freedom fighter. Storyteller. Beauty Seeker. For I am large. I contain multitudes. and sometimes I dance in the rain. I haven’t blogged or written much lately. 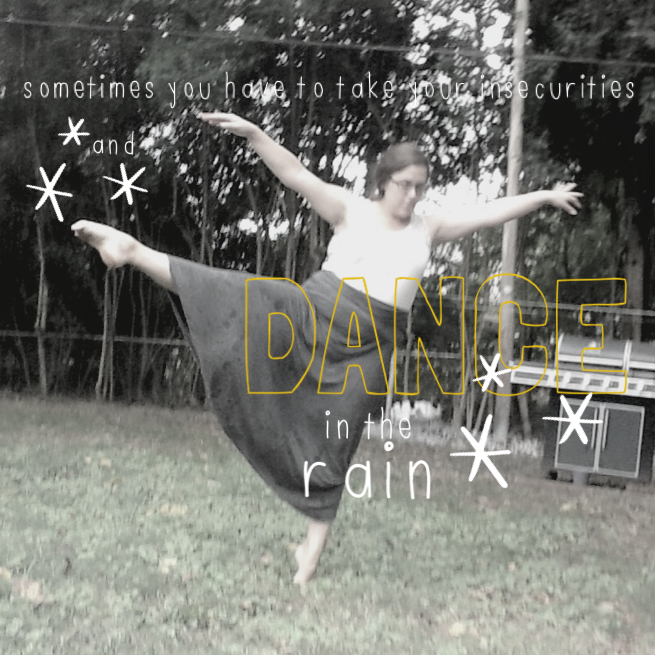 Perhaps I need to go dance in the rain…love the heart of what you shared here. Thank you. Thanks Maureen. 🙂 I’m always hesitant to do it–and my kids end up leading the way–but, when I do it’s always fun and freeing. I love this, on so many levels. thank you, friend, for this beautiful encouragement. Thank you for this post. Inspirational!